Analysis tools: In addition to ToSIA Comparison, there is a range of analysis tools developed and under development, which can be used as an add-on to evaluate TOSIA results. So far Multi-Criteria Analysis (MCA), Cost–Benefit Analysis (CBA) and Policy Analysis (PA) are part of the concept. Case study: Case Studies refer to the application of ToSIA in defined smaller projects, usually ensembles of FWCs, which are regionally and topically specified. Depending on the specification of the regional FWC, either the forest resources, the industrial production capacity, the product consumption, or the entire FWC are restricted to a geographical region (see specification of a FWC). An overview of present case studies can be found under the FWC case studies tab. Chain file: This file defines the information on the topologies (structures) of the chain. The file should contain the definitions of all chains that the user wants to load/analyse. Conversion factor: Mass in tons of Carbon is used as the information carrier for FWCs in ToSIA. Tons of Carbon is used in internal calculations in ToSIA to ensure that all information is comparable, and consistent. Each individual product needs a conversion factor from product unit to process unit, and from product unit to tons of Carbon (=original mass to mass of contained pure Carbon). Forest-Wood Chain: A FWC represents a set of Processes by which resources from forests are converted into services and products. In ToSIA, FWCs are dealt with at various levels. The highest level used hitherto is the European FWC which is defined as EU 25 plus Norway and Switzerland (EFTA countries). There are many kinds of FWCs at the more detailed levels. They can be geographically defined or linked to the main processing chains (paper, wood-products, bio-energy etc.) or to the topic of the chain (e.g. Reindeer husbandry in Malå). Within ToSIA, indicator values per material flow are taken from the database client, where a set of indicators has been selected and filled with values. In ToSIA, the calculated absolute process indicator values are determined based on the material flow through the process multiplied with the relative indicator value per process unit as defined in the database. Calculated module and FWC indicator values are then determined by aggregating the calculated process indicator values along the chain taking into account the system boundaries selected by the user. Links: As soon as two processes with their input and output products are defined, the processes are linked with each other. A link symbolizes where the output material flow of one process is going to. one-to-many (e.g. one pulp product is delivered to different types for further usage). The relation of these links is expressed as a split ratio. All split ratios of one product have to sum up to one. From the ToSIA database point of view, the module is just one of the classifiers for the processes. From a ToSIA run point of view, indicator values can be aggregated and compared at Chain, Module and Process level. Process (in a FWC); production process: The smallest and most important element of a FWC is a Process. Transformation of energy and materials takes place in a Process. 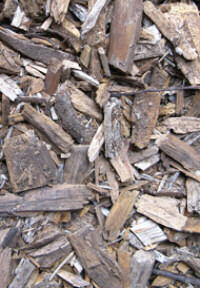 In a process (wood) material will change its appearance and/or move to another location. Every process requires inputs and produces outputs. Inputs for each Process in a chain are supplied by outputs of previous Processes. Therefore in case of the FWC we call inputs and outputs simply Products. Processes include eg planting trees, stand treatments, harvesting, transport, sawing, pulping, papermaking, printing, packaging, recycling, and energy production - or when needed subsets thereof. Processes file: This file defines the information on the processes that are available to be used in chains. Usually they are the ones that are used in the second file defining the topologies (structures) of the chain. There can be also unused processes in this file, but all that are used by the chains need to be included for successful loading. Product: Products are the Carbon mass-based inputs and outputs of processes, such as spruce logs or finished wood furniture. The functional purpose of products is to link together processes to form chain structures. Products are expressed in mass units and for each product the conversion factor, for converting it to different units (e.g. tons of C, m3, ha) needs to be stated. Processes can also receive input products from outside of the FWC system boundaries (e.g. imported materials or non-wood material used in furniture manufacturing). Product share (input/output): A product share is used to divide the material flow (in carbon) of each process into the input or output products. Usually all input or all output product shares add up together as 100%. Losses are also expressed as a share but not further connected to the next process if this does not correspond to reality. The only exception of more than 100% shares are growth processes, when the product share expresses the accumulation of Carbon due to growing. Growth process of reindeer is reflected by increased output share > 1.0. Output shares reflect the weight increase of the calves from the input product to the output product of the same process. Reference future: Reference futures can be calculated and modelled as possible prolongations over time from 2005 to 2025 as A1 and B2 for 2015 and 2025 as based on IPCC scenarios. In short, A1 describes a future based on globalization, high economic growth, low environmental awareness; whereas B2 incorporates regionalization, moderate economic growth, more oriented towards environment. These futures differ in wood demand from European forests. A1 less domestic demand, more import, B2 more domestic demand. Other reference futures can be defined and used. Scenario: A scenario is a combination of internal or external drivers and their impacts to the FWC. The scenarios result in alternative FWCs with different sustainability impacts compared to the current FWCs. Scenarios impacts can further be evaluated with analysis tools, such as MCA and CBA evaluation methods. Scenarios can be also combined with reference futures. In that case the reference future describes impacts as they are assumed for future development (compare "Reference future"), the future scenario is calculated as affecting on top of these changes. Scenarios may differ against the background of different reference futures. Split ratio: A split ratio is used to divide one product to many (output) or merge many products to one (input) in subsequent process(es). For more info see "Links". From the ToSIA database point of view, the stage is just one of the classifiers for the processes. From a ToSIA run point of view, indicator values can be aggregated and compared at Chain, Module and Process level, however not at stage level. Nevertheless, stages need to be entered for each process. Year of reference: All ToSIA calculations are referred to one year per alternative. This year can be past, present or future, and is defined by the case as part of the assumptions specified in the metadata. Variant/ Alternative: A variant is an alternative FWC in terms of indicator values, volume flow and/or slight changes in topology, and only exist in connection to a baseline case study (= basic FWC). Variants exist in reference futures and scenarios.